Set in London in 1947, this is a beautiful story about 12 year old Elsie, a misfit scholarship student at the girl’s grammar school. To avoid a gang of bullies during the summer holidays, she eagerly accepts a role in a play at the local theatre. Friendship, family life and childhood insecurities are explored with warmth, humour and understanding. “I took up Michelle Magorian’s A Spoonful of Jam with eager anticipation. Some time later, lost to everything else, I smelt the soup burning. So much for my supper but the book is a treat. Twelve-year-old Elsie, in the summer of 1947, has several things on her mind: her mother’s pregnancy, her social position as the child of a poor family at a grammar school, her father’s coldness, her fear of the local bully, and not least her desire – which surprise her as much as everyone else – to act. The setting is beautifully realised: a thousand touches bring that vanished world vividly before us, from the New Look dresses worn by the glamorous actresses to the huts of the Kent hop-pickers. “On one level this is a sort of post-war British fairy tale – poor girl with mousey hair and the wrong accent lands lead part in repertory play in a bid to ward off bullies. But that’s as close to Cinderella as Elsie Hollis gets. The author has a wonderful gift for hanging a richly woven tapestry around an essentially simple frame, and A Spoonful of Jam is every bit as compelling as her award-winning forerunner Goodnight Mister Tom, which was recently adapted for television. Her latest novel, which moves on from wartime to post-war Britain, is the story of Elsie, a twelve -year-old member of the large extended, working class but out-of-the-ordinary Hollis family who are coming to terms with the end of war. A demobbed father is causing some painful family readjustment. Then there’s brother Ralph, who has his own thespian ambitions; brother Harry, suffering initiation into working life; mother coping with pregnancy; and Elsie trying to hold her own at grammar school and fight off the neighbourhood mob. These are fulsome characters to cherish, whose storylines resonate and interweave to create an emotional roller-coaster of a novel. There are moments of high comedy amid darker passages of grief and torment. A meaty and powerful read. 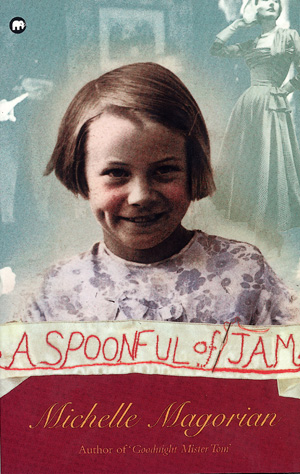 “Michelle Magorian’s A Spoonful of Jam is set in this universe’s 1947. Her heroine is Elsie, a young girl forced to deal with enough problems for anyone: being a scholarship girl at the posh grammar school; having to face a bully; and a father scarred by war experiences. “…the best book for children I have read in a long time, a book that should be promoted to all, young and old alike, in fact many war children will be able to associate with the family life. It is a book I will be promoting as far as family literacy goes. A book for everyone.